Wurth Electronics SMT flat wire high current inductors offer impressive energy density and low loss performance. Allied Component Works regularly addresses designs requiring advanced magnetics to achieve maximum density and efficiency in power electronics. 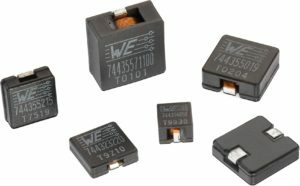 The Wurth Electronics WE-HCI series are fixed inductors with a somewhat improbable design that has provided impressive performance in recent applications. The windings in these components use flat ribbon wires with the narrow edge on the bobbin, offering very low DC resistance and large surface area to limit losses at high switching frequencies. Using this winding technique and advanced core materials, very high flux density can be achieved. Within the ICM14001 design, the Wurth 7443551200 inductor provides continuous and saturation current limits in excess of 20 amperes, with a DC resistance of less than 3 milliohms, all in a shielded package of less than a cubic centimeter. The heating and other efficiency impacts of the inductor are minimal with this advanced component, which easily exceeds the application requirements. The product also has a very robust package, is easily handled in assembly, and is readily available; all important attributes that are often hard to find in fixed inductors. These benefits also tend to appear in other Wurth products. As a result of this quality and performance record, when a fixed inductor or other magnetic component is required, we now usually begin our search with Wurth Electronics.